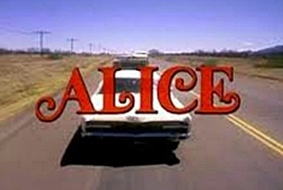 Alice (Linda Lavin) is widower with a young son (Philip McKeon) who decides on a fresh start in Los Angeles. Her car however decides to break down in Phoenix so she takes a job at a local diner (Mel’s Diner) before she can set off for L.A. again. Nine seasons later Alice is still at that diner and she and her fellow employees mixed with quite a few interesting customers made for some delightful comedy. 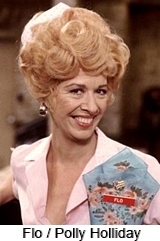 With her at the diner is Flo (Polly Holliday) who is really looking hard for a man and Vera who sweetness shines through even her most awkward and naive moments. 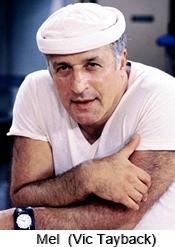 Leading the girls is the Diner’s grumpy short tempered owner Mel (Vic Tayback). Later in the series Flo leaves the diner, she gets her own spin-off series, and is replaced by Belle (Diane Ladd) and then later by a woman truck driver named Jolene (Celia Weston). The show was so popular that a virtual cavalcade of television stars could be found on any given night making guest appearances. Sometimes they would even appear as themselves including Jerry Reed, Joel Grey, George Burns, Art Carney, Telly Savales, Dinah Shore, Robert Goulet, Meadowlark Lemon, and Donald O’Connor. 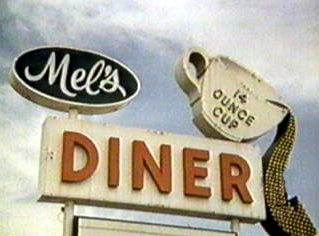 There is an even longer list of stars who appeared as characters who just wonder through Mel’s Diner on their way elsewhere adding their own brand of comedy to the sitcom. 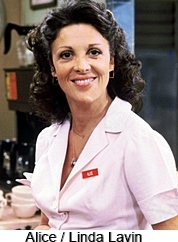 Linda Lavin’s character Alice was looking for her big break as a singer but Lavin, a singer in real life, asked for and received a couple of opportunities to launch her own singing career by performing on the show. agreed to change the name to Mel’s for the show.